In North America, various species of bark scorpion can be found across the southwestern part of the continent. Their range extends down into Central America and northern South America. For example, the specimen at the top, C. edwardsii, ranges from Mexico to Colombia. 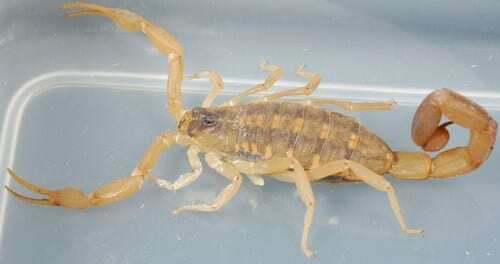 These scorpions are highly adaptable and may be found in deserts, forests, and grasslands. They hide in crevices, under rocks, or beneath tree bark, among many other places. Like my mailbox. Like spiders, scorpions are arachnids. They don’t catch prey in a web, however. Instead they wait until their prey wanders by, feeling with the sensitive hairs on their pedipalps for the vibrations it creates. They ambush the animal—be it a spider, insect, or even a centipede—and sting it with the venom in the telson at the end of their tails. When the prey is paralyzed, they liquefy it with enzymes and slurp up what remains. Scorpions don’t get just one party fact. They get three because they are awesome animals. 1) Although bark scorpions are generally solitary, they occasionally congregate in large groups, particularly in winter. This makes for extra excitement when taking the trash out barefoot if they’ve chosen to congregate under the bin. 2) Scorpions are viviparous, meaning their offspring are born live. The offspring, averaging 30 in number, then crawl onto the female’s back. She carries and protects them until their first moult, which is when they climb down to fend for themselves. Although they live independently after leaving the female, immature scorpions have been observed climbing onto the backs of other adult female scorpions. 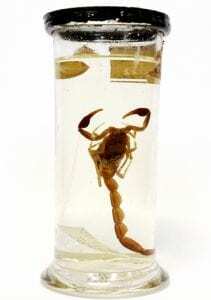 3) The scorpion is covered by a waxy cuticle that helps prevent water loss. This cuticle fluoresces a bright blue under UV light (but we don’t know why). 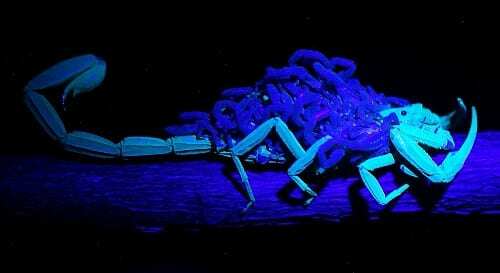 UV induced fluorescence of an adult scorpion and absence of fluorescence in juvenile scorpions (that are hanging onto mom). And remember, if you ever visit scorpion country, shake out your clothes. You never know where one will pop up next. Gouge, D. and Olson, C. (June 2011). Scorpions. Arizona Cooperative Extension. Hurst, N. (19 October 2016). How Scorpion Venom is Helping Doctors Treat Cancer. Smithsonian Magazine. San Diego Zoo. (2017). Scorpion. Animals and Plants. Stafford, M. (November 2015). Arizona Bark Scorpion. U.S. National Park Service, Grand Canyon National Park. Texas A&M University. (n.d.). Striped Bark Scorpion. Field Guide to Common Texas Insects. U.S. National Library of Medicine. (February 2013). North American Centruroides (Bark Scorpion Venom). Toxicology Data Network. Leah Christian is Front of House Volunteer in the Grant Museum of Zoology, and a UCL student of History and Philosophy of Science.